The Yacht Phyllis – … a good friend of old gaffers, nobbies and hookers. This website records for posterity the restoration of the yacht "Phyllis" (1913). In the time that our website has been online, we are pleased by the number of contacts who have helped us in our research and endeavours. Particularly, we believed "Phyllis" to be a Royal Mersey Restricted Class yacht. We have now been advised that she may be even more unique. Completed in June 1913 to a design by GH Wilmer, she's built to the RMRC class envelope but with the exceptions of a slightly shorter overall length, a heavier build and a deeper keel. The first owner FW Whitely, a longstanding member of the RMYC and a restricted class yachtsman, who commissioned her, is said to have sailed her directly to Hibre Island where his family still has today a summer cottage on the island. "Phyllis" is named after his eldest daughter. Hopefully our continued research, and with the help of others, we may be able to learn a little bit more. Today "Phyllis" keeps company with the Nobby Owners Association and looks forward to going out around the buoys with Lancashire Nobbies, Old Gaffers and any Irish Hookers who are around. She is on the National Small Boat Register (R1387) as a vessel of historical maritime interest. 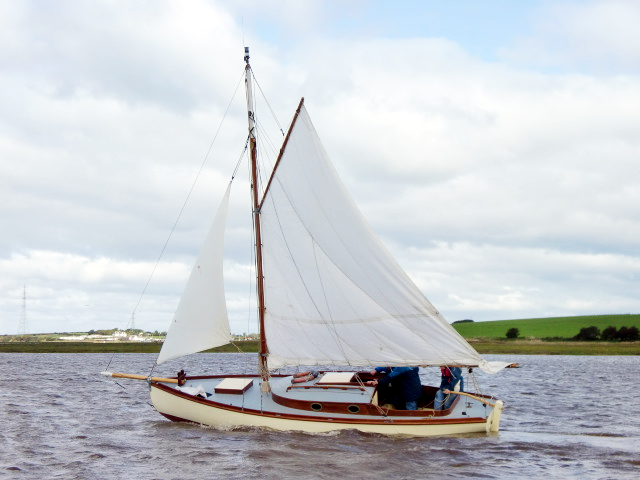 Carvel built, pitch pine on oak frames, her rebuild was completed in 2010 and she was immediately nominated on the shortlist for the 'Classic Boat' magazine restoration of the year. 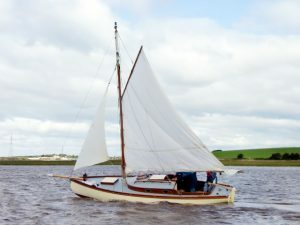 The hull design is based on the very successful Lancashire 'nobby' design, extensively used on the Northwest fishing grounds of the Lancashire and Welsh coasts. These fishing boats, locally known as 'Nobbies', were reputed to have a very good turn of speed in the Irish Sea and were often seen beating the local racing boats back to port to get their catch to market. "Phyllis" was built by Samuel Bond at Rock Ferry on the Wirral to a design by GH Wilmer. Bond's built several Royal Mersey Restricted Class yachts for club members. Bond's yard was situated alongside the RMYC clubhouse. If anyone knows about any of the remaining vessels in the class, please do let us know.